release of the GNOME Activity Journal codenamed “Defying Gravity”. 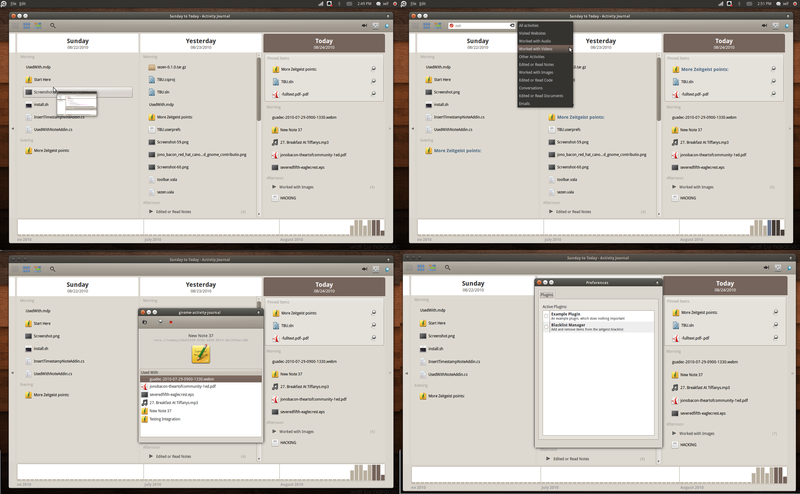 What is GNOME Activity Journal? The GAJ & Zeitgeist teams are proud to announce the 0.5.0 development release of the GNOME Activity Journal, codenamed “Defying Gravity”. Special kudos for major contributions to Hylke, Randy, Seif, and Siegfried! GNOME Activity Journal is an Activity Browser, which lets you quickly find what you did – with files, emails, and on the web. As opposed to File Browsers, it mainly focuses on when you did something rather than where the items you worked with are located. GAJ is powered by the awesome Zeitgeist Framework. This entry was posted on Tuesday, August 24th, 2010 at 5:03 pm	and is filed under Uncategorized. You can follow any responses to this entry through the RSS 2.0 feed. You can leave a response, or trackback from your own site.